There’s nothing that says summer like the sweet, succulent flavor of melons. What a refreshing, tasty warm weather treat! When plucked fresh from the vine at the perfect ripeness, they have a flavor that brings a smile to everyone. A slice of melon makes the perfect ending for any summer picnic or barbecue. The most important factor in growing melons is heat. The hotter your climate, the better melons will grow. In warmer climates you can grow seed directly in the ground starting in early spring. However, where the growing season is shorter you will need to grow fast maturing varieties and plant starter plants from seed grown early indoors. You can also lay black plastic over the soil around the plants or cover with a floating row cover until the plants start flowering. Make sure to sow seed or starter seedlings after the soil has warmed to at least 60 degrees. If you grow vegetables in raised planter beds, the soil will warm up faster than on flat ground. If you must plant on flat ground, make sure the area has good drainage. Always prepare all sites by adding an organic soil amendment and a good starter fertilizer. Plant your starter plants (or two or three seeds in one hole, thinned out later if needed) at least two feet apart or grow vertically on an arbor or trellis. Melons take up a lot of room, so plan accordingly. Make sure to avoid planting near cucumbers, or the cross-pollination can create undesirable flavors in both fruits. Try to avoid overhead watering at all costs, because that can make melons more susceptible to mildew and other diseases. Using drip irrigation or a soaker hose will help to avoid wetting the foliage. Water often enough to keep your plants healthy. Once the melons have reached full size (check label or seed package for size)–but before they have fully matured–cut back on watering to avoid bland flavor and splitting of the fruit. 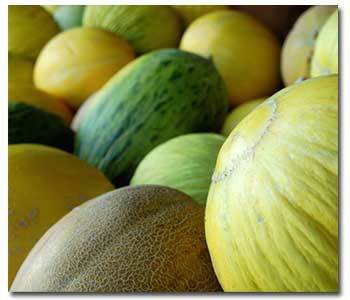 When melons are fully ripe, they slip off their vines quite easily. Harvest honeydew types when they turn color or when the leaves where the fruit is attached start to turn yellow. It’s spring so plant now! You’ll soon be on your way to a great crop of delectable, sun-sweetened summer fruit.